Westmatic is dedicated to providing our customers with the most efficient, safe and reliable automatic large vehicle wash systems in the world. With over 35 years of international experience, Westmatic is proud to offer the widest range of vehicle washing equipment on the market today; From, friction (brush) rollover and drive-through systems, to touchless rollover and touchless drive-through systems. Westmatic's large vehicle wash systems are operating at thousands of facilities worldwide. 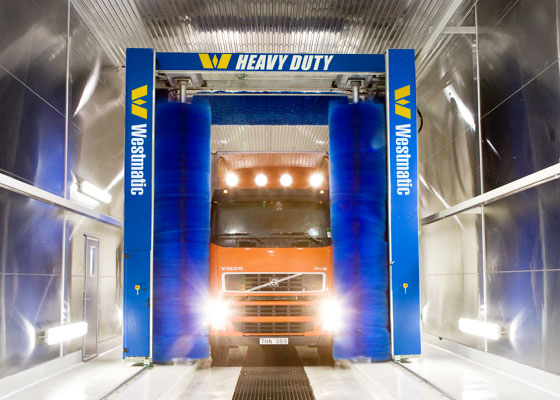 Thanks to their Scandinavian engineering, Westmatic's vehicle wash systems are extremely efficient and capable of reducing your cost of the washing operation. Westmatic's vehicle wash systems are truly the "greenest" option for cleaning your fleet. Compared to traditional systems, Westmatic uses nearly half of the water, chemical, and electricity. This ensures drastically reduced costs of washing your fleet. Water recycling and water purification is also an area of expertise for Westmatic. Coupled with our advanced wash systems, a water recycling system is not only environmentally beneficial but a fiscally wise decision as well. Water recycling has become an increasingly important component of any modern vehicle wash system. Westmatic's proven water recycling and water purification systems use cyclonic separation to achieve water quality of 10 microns. Odor control/bacteria growth elimination is achieved by natural ozone injection. This safely and effectively eliminates any odor-causing bacteria. The injection of ozone also accelerates solids precipitation. Westmatic's water recycling systems enable water reclamation of up to 85%, greatly reducing sewer impact fees and monthly bills. For decades, Westmatic has been producing effective, cost-efficient water reclaim equipment that has met the strict requirements of the Swedish National Environmental Protection Agency. At Westmatic, we not only take pride in our state of the art line of wash equipment but our service and technical support as well. When you purchase a Westmatic vehicle wash system, you will receive outstanding service and technical support. Westmatic's wide service network of factory authorized personnel is dedicated to resolving any issue you may have within 24 hours of notification. All design, development, and manufacturing for North America is completed under one roof, at our North American headquarters in Buffalo, New York. This provides our customers with exceptional delivery time and customization of equipment. Each machine is designed custom per our customers' needs. Westmatic's wash systems are backed by factory trained technicians throughout greater North America.